Throughout the past decades we find numerous terms in the popular business press and academic literature that refer to an increasing inability to grasp the world and deal with the things happening around us. Examples include uncertainty, turbulence, rapid change, dynamism, disruption, complexity, hyper-competition, high-velocity markets and flux. For a couple of years, the notion of “VUCA” is gaining popularity as a term to cover the various dimensions of this ‘uncontrollable’ environment. In various posts and articles, we read, for example, about a “VUCA World” and in particular about “Leadership in a VUCA World.” But what does being and leading in a VUCA world really mean? Sure, VUCA is an acronym. It stands for Volatile, Uncertain, Complex and Ambiguous. And sure, there are plenty of explanations including a Harvard Business Review article by Nathan Bennett and G. James Lemoine and a page on Wikipedia. But despite these explanations, some further clarification can be helpful. Volatility - Volatility refers to the speed of change in an industry, market or the world in general. It is associated with fluctuations in demand, turbulence and short time to markets and it is well-documented in the literature on industry dynamism. The more volatile the world is, the more and faster things change. Uncertainty - Uncertainty refers to the extent to which we can confidently predict the future. Part of uncertainty is perceived and associated with people’s inability to understand what is going on. 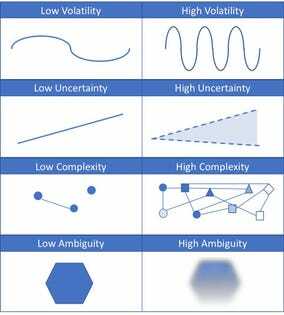 Uncertainty, though, is also a more objective characteristic of an environment. Truly uncertain environments are those that don’t allow any prediction, also not on a statistical basis. The more uncertain the world is, the harder it is to predict. Complexity - Complexity refers to the number of factors that we need to take into account, their variety and the relationships between them. The more factors, the greater their variety and the more they are interconnected, the more complex an environment is. Under high complexity, it is impossible to fully analyze the environment and come to rational conclusions. The more complex the world is, the harder it is to analyze. Ambiguity - Ambiguity refers to a lack of clarity about how to interpret something. A situation is ambiguous, for example, when information is incomplete, contradicting or too inaccurate to draw clear conclusions. More generally it refers to fuzziness and vagueness in ideas and terminology. The more ambiguous the world is, the harder it is to interpret. As illustrated in the picture above, in a purely volatile (but not uncertain, complex and ambiguous) world, there is a lot of fast, but predictable change. On the other hand, in a purely uncertain (but not volatile, complex and ambiguous) world, it is just hard to tell how things develop. And in a purely complex (but not volatile, uncertain and ambiguous) world, things are hard to untangle and understand. Finally, in a purely ambiguous (but not volatile, uncertain and complex) world, things are just hard discern.